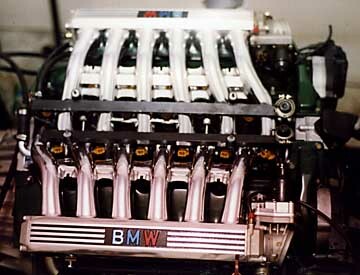 This information starts with a basic rebuild of the BMW V12 to stock specifications, then options are listed for different horse power levels. Each option builds on the previous. The additional parts and labor are noted. 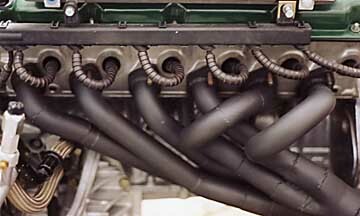 BMW did not intended for the block to be bored, therefore all Power Plant rebuilds utilize steel liners, installed, bored and honed to the final size. Certain detail work is performed on all engines, starting at the stock rebuild level. Some of these details are: balancing and blue printing, high performance 3 angle valve seat cut, radius head bolt holes, chamfer and radius sharp edges in combustion chamber and piston tops. There are some parts that are not included in the regular rebuild price. These items are usually only needed on extremely high mileage engines. 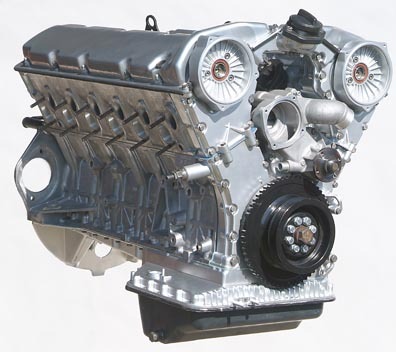 These parts include : oil pump, rocker arms, hydraulic lifters, intake valves. These parts are assessed during disassembly and inspection. The customer is then notified as soon as possible, of the total costs involved. A long block rebuild from The Power Plant is similar to what you would get from BMW if you ordered a remanufactured engine. It is a bare engine from oil pan to valve covers, with no ancillary parts. This kit changes the stroke of the engine from 73mm to 86mm, the bore from 84mm to 86mm and the compression ratio from 8.8/1 to 10/1. The 6.0 conversion on an otherwise stock rebuild makes 405h.p. & 425lbs/ft. This package is a continuation of the complete rebuild of the engine with the upgrade to 6 liters. The 6 liter parts change the stroke of the engine from 75mm to 86mm, the bore from 84mm to 86mm and the compression ratio from 8.8/1 to 10/1. This engine is a 6 liter bottom end build, with custom 4 valve per cylinder, heads. detailed information is available for serious inquires. 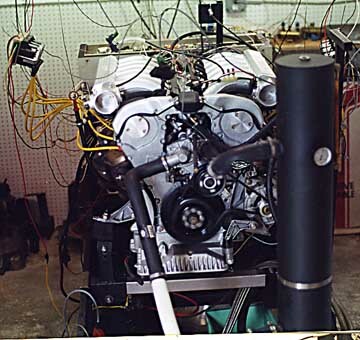 The Power Plant has an in house engine dynamometer and a cooperative arrangement with a chassis dyno shop. Although performance chips can help an engine produce more power, each engine has its own characteristics that can be optimized by tuning the fuel and ignition for that engine specifically. After-market performance chips are usually based on a stock engine. On modified engines, especially stroker engines, custom chips are an absolute necessity if longevity, maximum power and low emission are desired. With a dyno, changes in mixture and ignition can be adjusted for peak performance and clean emissions. The power can be measured to an accuracy of 1%. To get it right tuning on the street, would be guess work at best. A major benefit, is a controlled initial run in of the engine, which can optimize performance and longevity. This just can’t be done on the street. The engine has to be put through load cycles. A few minutes of running with a load on the engine, then a few minutes of idle to let parts cool and the temperatures normalize. The length of time and amount of load is determined by watching the oil temperature, blow by gasses and other indicators. Then the load and rpm is increased in steps as the indicators show the progress. With the engine properly run in from its new condition, all the wearing and sealing parts are correctly mated. The pistons, rings and cylinder walls will seal more completely and more evenly. Better sealing means more power. More evenly means longer life for the cylinder walls and rings. Another benefit is the ability to make a custom chip for the DME and optimize the fuel and ignition for maximum power. The full load and part throttle parameters can be changed to optimize power without changing the low speed and low load values required to meet emission tests. Another benefit is the ability to verify that everything is working correctly, and there are no problems. From oil leaks or cracked spark plugs to main or rod bearings, almost anything can be detected and corrected. The crank is made from a solid piece of 4340 steel billet. This is the industry standard alloy and can be found in everything from custom hotrods to Formula 1. These cranks are a full featured precision part. They are designed to bolt in and use the standard BMW bearings. They feature radius oil holes, knife edge counter weights, large fillet radius and nitrite hardened surface treatment. With the recent interest in performance modifications for the BMW M70 engines, I have collaborated with a high quality and long established cam manufacturer to make an efficient and aggressive cam package. This package changes the M70 valve train design from a pad follower to a roller type design. The cams themselves are custom units made from a steel billet. With the M73 engine having the components of a roller design we decided to incorporate those into the performance package for the M70 engine. There are several advantages to a roller type valve train. The two main attributes are the reduced friction and the ability to have a faster ramp design on the lobe. These cams are designed to have a operating range to 7500 rpm. Idle quality is very good with just the slightest hint of lope. Depending on other tuning modification, the cams peak hp can be between 5700 and 6800 rpm. lobe centers 112 deg. 110 deg. Raising the redline from 6000 to 7000 and adding 11mm to the stroke, adds the same amount of stress as turning the engine 2000 rpm over the designed redline. The stock rods are not strong enough, or long enough, so custom rods made from 4340 billet steel are used. In order to maintain a stroke to rod ratio that is correct for the longer stroke crank, the rods are 3.5mm longer than stock. 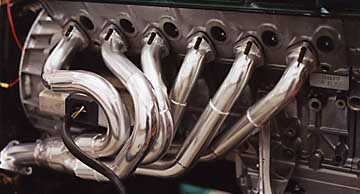 For the 500hp version, the manifolds are extensively modified. To meet the higher rpm band and additional air flow requirements, the plenum is enlarged and the runners are shortened. This changes the tuning of the intake system which was originally designed for a torque peak at 4000 rpm and hp peak at 5200 rpm. This engine has a peak torque at 4500 rpm and a hp peak at 5700 rpm. These are custom, forged, high silicone content aluminum alloy, and designed specifically for what ever the application. For this option, the stock DK throttles are completely disassembled and rebuilt. While they are apart, the housing is bored to a 3mm larger diameter and a larger throttle plate of stainless steel is fitted. The final product is a stock appearing throttle with 26% increase in area around the plate for more air flow. For the 500hp version, custom, bigger throttle housings are made from aluminum billet and the servo motor from the stock DK throttle is transferred to them. This way all the stock engine management system can be retained. The stock throttle is 57mm diameter, the custom throttle bore is 65mm, a 33% increase in area. For engines requiring an alternative engine management system such as Electromotive or Motec, custom throttles are made from aluminum billet. The throttle size is dependent on the application. They are designed for cable actuation. The headers are made specifically for the application. They are a stepped design made form mild steel and then coated with a ceramic thermal barrier coating inside and out. The coatings really cut the heat transfer and reduce under hood temperatures dramatically. The step design is the latest in “state of the art” techniques for extracting the most power from an engine. From the BMW technical information system - “the block has an increased concentration of silicone crystals at the cylinder bore surface during the casting process and can not be machined.” For rebuilding purposes, we bore out the cylinders in the block to accept a steel liner. The block is then heated and the steel sleeves are slid into those bores. As the block cools it shrinks to a tight fit around the steel liners. The new steel cylinders are then honed to the final bore dimension and the block is decked. This process is also used by BMW on some of its other late model aluminum block engines. These are made of the highest quality stainless steel and are made to fit with all the stock BMW hardware. To meet the air flow and rpm tuning requirements, a completely redesigned and fabricated intake system is needed. 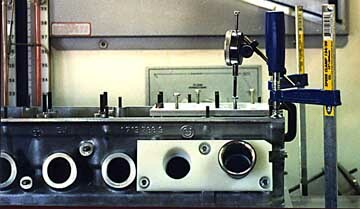 The ports on the head are enlarged so much that the stock intake manifold is not thick enough to match the cylinder head port. The engines making 500 or more hp also make about as much torque, and the original BMW clutch will not hold. For these engines the custom clutch and flywheel package is necessary. A light weight, heavy duty, single plate disc capable of holding up to 800 ft/lbs of torque is used. To use the above clutch, a custom flywheel is made. It is machined from billet aluminum, with a steel insert for the clutch disc friction surface. Reproduction / duplication of photographic material or content is strictly prohibited without approval in writing from the copyright holder.